Back in the day, during my stay at Susan Miller Dorsey high school, my best buddies were Duane Kamei, David Ritchie, Rick Fukamaki and Rob Karatsu. I hated school and can validate Einstein's unpublished theory that time moves slower when you are looking at a clock. Phillip Sakimoto told us the same thing every Wednesday: cheer up, it's hump day. The middle of the week; we're now halfway to the weekend and getting closer with each moment! True, but to me Wednesday might as well have been Monday. Friday arrived. Eventually. And that meant playing automobile roulette on Friday and Saturday evenings to get out and do what I considered my favorite pastime: going cruising. None of us had our own cars back then, but the odds were good that at least one of us could obtain wheels on any given evening if our parents or siblings were in a generous mood. I mentioned my dad's monstrous Ford LTD yesterday. Among my buddies, Duane would borrow his brother's Chevy Nova; David either his parents Chevy Impala station wagon (the "Battlewagon" with license number SMD 944 that I remember because SMD = Susan Miller Dorsey) or his sister's Datsun station wagon; Rob had his parents Chevy '63 Chevy Impala (the "Heavy Chevy"); and Rick had his mom's Dodge Dart. On those nights when we had no specific destination, which was often, we'd simply go cruising wherever the road took us. We'd each chip in for gas. Short distances required only a buck. Three bucks meant a little more than ten gallons, which opened a wide range of possibilities. With three dollars in the tank we were the richest guys on the streets. Where'd we go? Anywhere. One night we decided to drive down to San Diego, so that's what we did. All the way there, turned around and then all the way back. Same thing with San Bernardino, although once we got there we wondered why we'd been stupid enough to pick a boring place like that for a destination. Aside from those extremes, nornally we confined ourselves to the greater Los Angeles area, which we got to know very, very well. I loved getting out into the night. It didn't really matter to me where we went, as long as we went someplace. The character of the streets, stores and offices with their electric illumination was so much different than in the daylight; the roads less crowded; the smog not visible; it was so much more peaceful and tranquil than when the sun was up. I loved it. I always felt that something was out there in the night, something inviting but just beyond reach. Or rather, beyond reach until that one night we'd find it via the cruising we did. Everything looked more romantic and exciting at night. It possessed enchantment that the day couldn't possibly match. I imagined myself being part of the night, part of the scenes we would pass as we traversed the avenues and boulevards up and down the city. I'd see a couple framed at the window table of a nice restaurant, the warm glow of the lights providing the background, and wished that were me. A while earlier I wrote about my unpleasant summer night at the Phrog in Gardena, the dance at which Cindy Azuma and Duane became an item while I stood by and watched. Like a more recent post about collecting insects and how the dragonflies I tried unsuccessfully to catch often returned to their perch for a second chance, now it was November and Duane had moved on to other girls, leaving Cindy available again. Do you remember the music group Jo Mama? I had the pleasure of hearing them in concert once, as the opening act for Carole King and James Taylor. What a lineup, huh? The cover of their debut album, pictured below, showed them sitting inside of an Italian Restaurant named O Sole Mio. 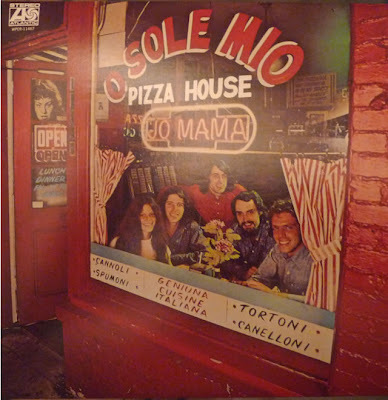 While listening to the album one day I looked at its cover and wondered if O Sole Mio was a real place. There was, after all, a street number next to the doorway of the red brick building in the picture. So I looked in the phone book. And there it was, O Sole Mio, on Western Avenue in Hollywood. Various smaller signs plastered on the walls contained messages, warnings and other eccentric musings from Vittorio Regina, the chef. Stuff like threats if you didn't pay, or don't ask for too much special stuff on your pizza or else, and other things that made us wonder what sort of kook this guy was. Then the kook came out to talk to us, speaking Italian to our uncomprehending faces. "Acqua," he said, picking up one of the glasses of water. "Acqua," Cindy giggled as she repeated it back to him. After saying several other things in a charming but incomprehsible manner, Vittorio strolled back to his kitchen leaving us chuckling with confused grins. The man was like the signs he put up on the walls. You can probably guess where we sat. Hey, this was neat - we're Joel Bishop O'Brien and Abigail Haness (Jo Mama's drummer and vocalist), framed sitting at the window table inside a cozy Italian pizzeria looking out into the night while Chef Vittorio hand-tossed our pizza in the kitchen. The pizza? It was pretty good. It's probably the thinnest pizza I've ever eaten. It could have been the worst too (it wasn't), but it wouldn't have mattered. The setting was perfect, the company was great, and while O Sole Mio was far from fancy, it was the night scene I had imagined so many times during so many cruises. Normally I have a YouTube video at the end to go along with the post, but the song I wanted to use is nowhere to be found on that site. So I uploaded my own. It's in .wma (Windows Media) format; please click here and give a listen. Addendum: many years later I penned the following lyrics, I suppose a cynical retort to the night scenes I romanticized way back when..
Haha.. so much for my attempt to be Donald Fagen.. I was the bouncer/repair guy at the Phrog. Sorry you had a bad night. Hope it was the night we had Beaudry Express and Hiroshima. K.T. Yamashita, the manager, went on to become a notable author/playwright, wife, mom, and professor.